nextGREAThire.com: Job Seekers - what sources do you use to gather info about job openings? Job Seekers - what sources do you use to gather info about job openings? See this fancy graph on the left that you can't read because it's too small? What Sources of Information Did Candidates Use? 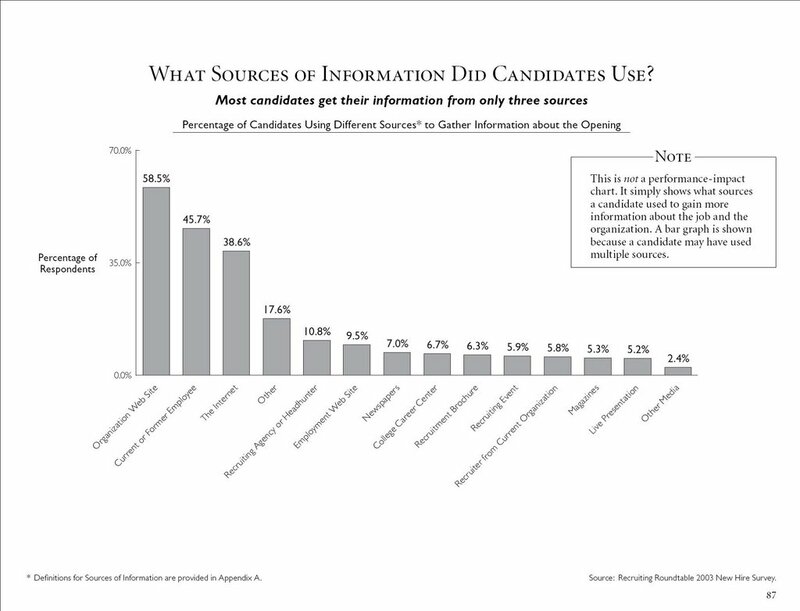 Most candidates get their info from only three sources. 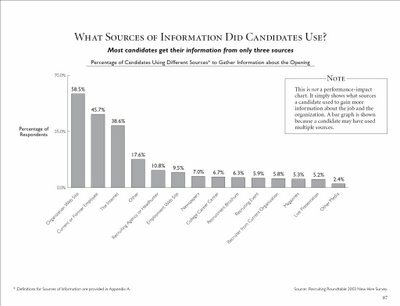 Then, it details the %'s of candidates which use the various sources to gather info about job openings which hold their interest. This is reeeaaallly interesting. 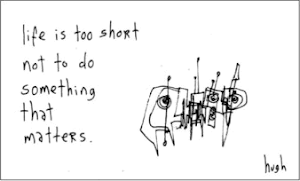 And if you are a "job seeker," I'd be equally as interested in knowing if this is true for you. The details come from a 2003 study by the Recruiting Roundtable which surveyed "New Hires," asking them how they learned about the job for which they were hired. Wow! And this data is 3 years old! 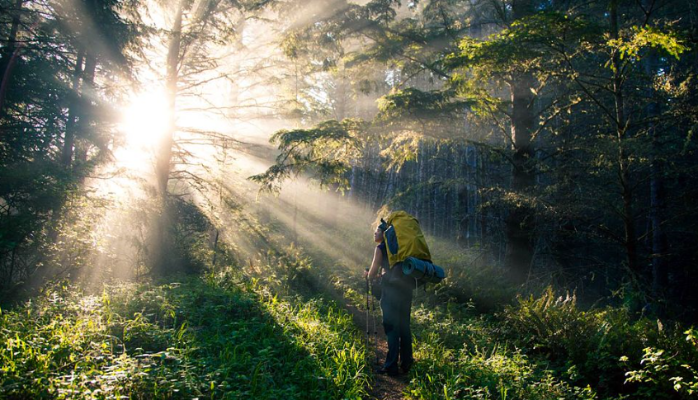 So, job seekers, are you using blogs to assist in your job search? 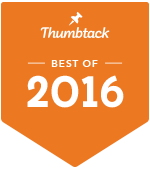 Corporate blogs? If you are reading this post and you are looking for a job, then the answer is Y-E-S.
Now, somebody tell me one more time why blogs are not being utilized more to reach the community of job seekers? Actually, don't answer that question. I'd just as soon you go on thinking that blogs will never play a major role in reflecting an employer's brand to the marketplace, and that job seekers and consumers aren't talking about our jobs and our products. In fact, I'd be thrilled if you'd just continue believing that the average consumer and/or job seeker would rather visit your static website and read all the fancy verbiage you've written about your job openings. "They do not exist...they do not exist....these candidates are not using The Internet to gather the information they need about the jobs they want." There now. I feel much better and I'll have fewer corporate bloggers to contend with.